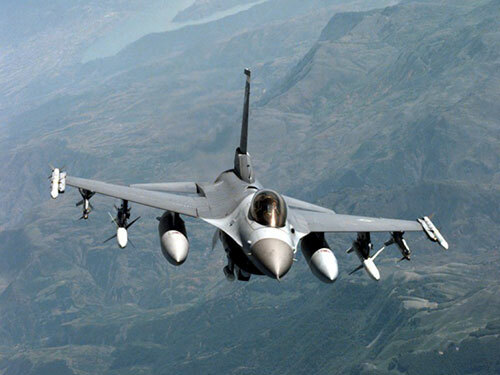 With the Indian Air Force beginning the process of buying 110 fighter jets, in a deal that could be worth more than $15 billion, Lockheed Martin has expressed its readiness to shift its F-16 fighter aircraft manufacturing unit to India -- and the US government, according to the manufacturer, will allow it to do that. That apart, the American global aerospace and defense major is also prepared to transfer the technology of its third generation anti-Armour Javelin guided missile system to India for its future manufacture. At least two Lockheed officials at the Def Expo 18 told IANS that if the defense procurement deals were signed with the company that is all geared to bid for the world's biggest fighter jet order, it would walk the extra mile and transfer technology to local partners for sophisticated parts of defense products. "We are offering a deal that is completely compatible with ‘Make in India' -- offering a stand-up production line in India," said Randall L. Howard, who heads International Business Development for aircraft at Lockheed Martin Aeronautics. He said the single-engine supersonic multi role fighter aircraft that has seen action in the Afghanistan and Iraq wars was currently being built around the world, and setting up facilities in India would not impact jobs in the US. Another Lockheed official, Haley Don oho, who is business development head of the shoulder-fired anti-Armour Javelin missile, said a possible joint venture for the system "is in good standing with the Indian government". He said Lockheed has got the US government's nod to transfer its "high-degree" technology to its partners in India for the development of the 22 kg, portable missile system that comes with a combination of "fire and forget" and "man in the loop" capability, with a range of up to four km. The missile, which automatically guides itself to the target after launch, has been used by US forces in the cold mountains of Afghanistan and in the hot deserts of Iraq. With its arched top-attack profile, Javelin climbs above its target for improved visibility and then strikes where the Armour is weakest, he said. "The US government was ready to transfer high-degree technology under US-India Defense Technology and Trade Initiative (DTTI) when the previous deal was done. The US government has indicated to us, and to the Indian De fence Ministry, that we will continue on the discussion with similar levels of transfer of technology. Asked about the future of India's fledgling indigenous defense-building capabilities, the two officials said it was only a matter of time before the country emerges as one of the major military manufacturers in the world. "I think it is coming. We will see whether it will take off quickly or slowly. But I think it is coming. This is India. Lots of engineers, lots of researchers, people with lots of capabilities. It is only a matter of time. We see it is coming," Don oho said.